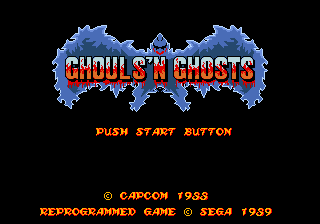 Ghouls'n Ghosts, known as Daimakaimura (大魔界村) in Japan, is a platform game developed and published by Capcom for its CPS arcade system in December 1988 as a sequel to the earlier Ghosts'n Goblins (Makaimura), released in 1985. Its popularity saw it ported to many home systems of the era, including the Sega Mega Drive and Sega Master System in 1989 and 1990, respectively. Ghouls'n Ghosts features the knight, Arthur who must restore souls stolen by the evil Lucifer (including that of his lover, Princess Prin Prin). Though it is considered a classic, Ghouls'n Ghosts is notoriously difficult thanks to the constant waves of enemies and traps despite Arthur only having a couple of hit points. and jump, attacks. In the Master System version attack and jump. The Mega Drive release of Ghouls'n Ghosts, handled by Sega, was a notable milestone in the console's first couple of years as for the time, it was considered the most accurate home version of the game. In the west, it was billed as selling point for the Mega Drive system during its first few months, retailing at a higher price than most games available for the console at the time. It also marks the beginning of Sega's relationship with the then-industry powerhouse Capcom, who until this point had avoided releasing games for Sega systems. The Mega Drive version has since been re-released as part of the Wii's Virtual Console service. Main article: Ghouls'n Ghosts/Magazine articles.